When we took a trip over to Ardnamurchan in May, we stopped a few miles west of Glenborrodale and walked down to a beautiful little bay called Camas nan Geall, or ‘the Bay of the Strangers’. 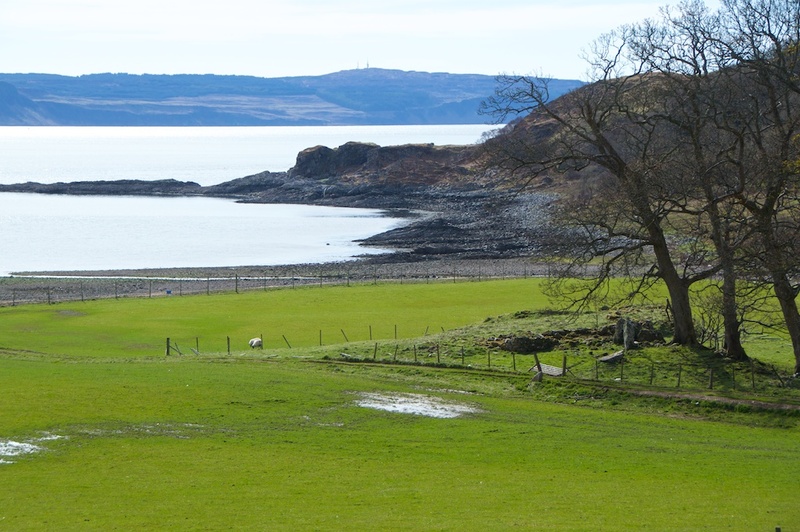 There’s a layby overlooking the bay, and a farm track leads to the field below. 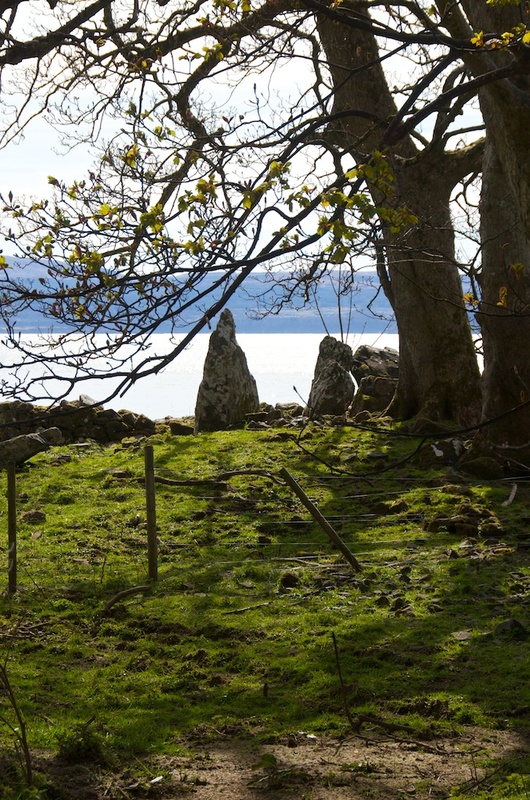 The path runs parallel to the coast and then turns at right angles, heading straight for a fascinating group of archaeological sites: a Neolithic chambered cairn, a standing stone and a small burial ground. You can see the last two in the left of the photo, above. The setting is nothing short of idyllic. But it seems that it’s easier to read the geology of the nearby mountains – which is in itself fascinating – than it is to interpret with any accuracy the significance of the stones that were placed here, perhaps as much as 5,000 years ago. 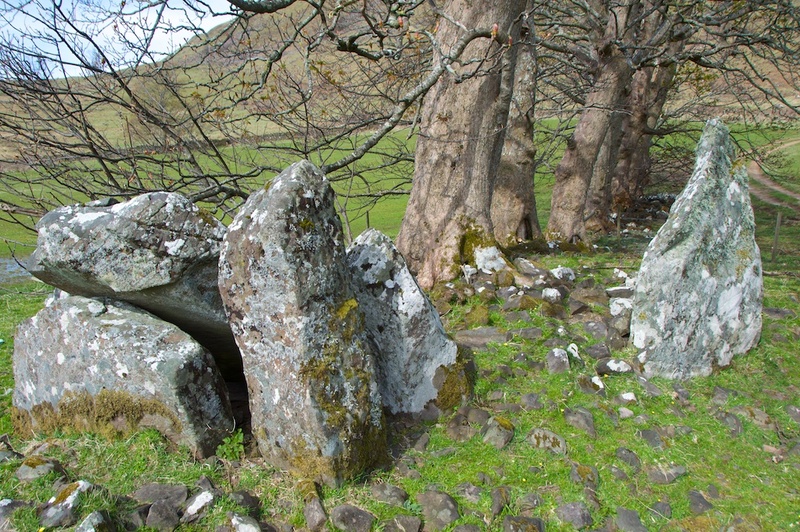 The fact that the RCAHMS considers the burial chamber to be ‘largely destroyed’ pretty much speaks for itself. 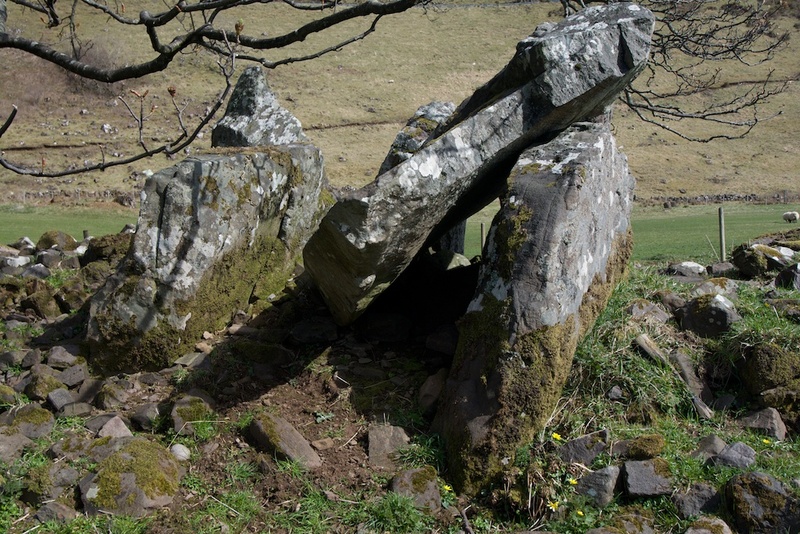 A handful of upright stones lean against each other like drunken revellers, trying to support a capstone that has now collapsed; and a huge flat slab, one of two which are believed to have stood at the entrance to the chamber, lies on the ground just a few yards away. 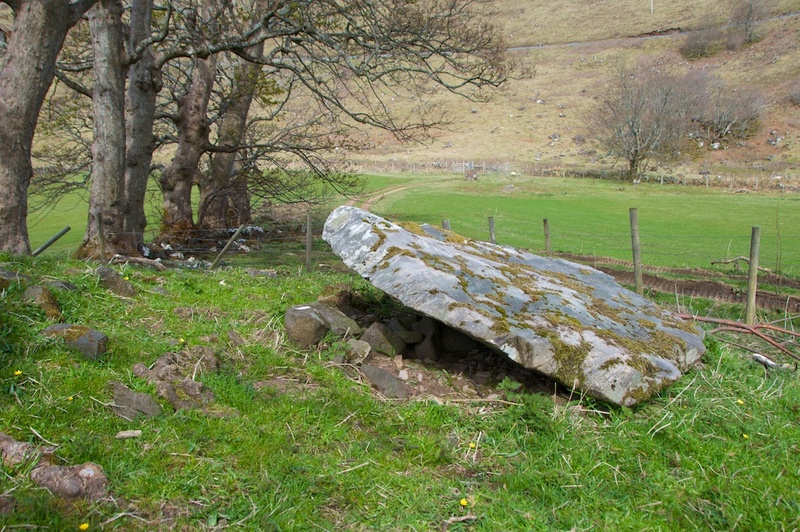 The second entrance stone has fared better, and appears to be still in place. Wide at the bottom, it tapers upwards to a rounded point and bears some very interesting markings on its lichen-mottled surface. To me it appeared almost like a benevolent guardian, although what it once stood to protect has been prised open to the heavens and scattered beyond all recognition. 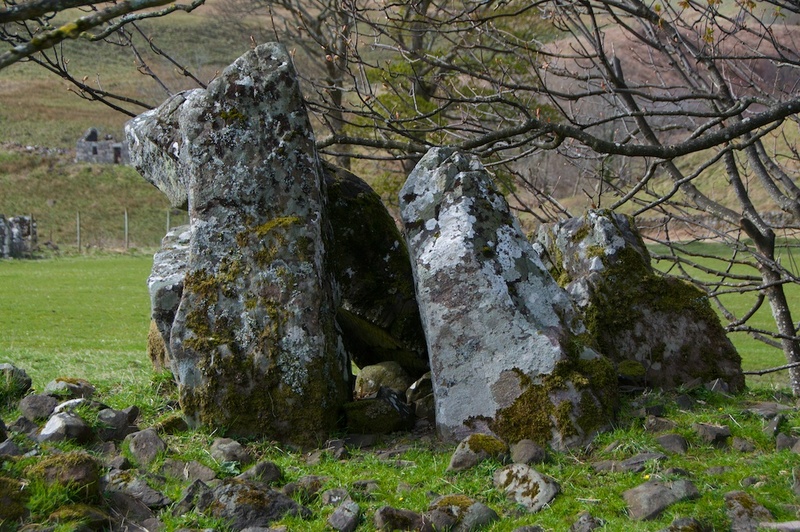 Small stones litter the ground around the cairn, but it’s impossible to make any sense of them. 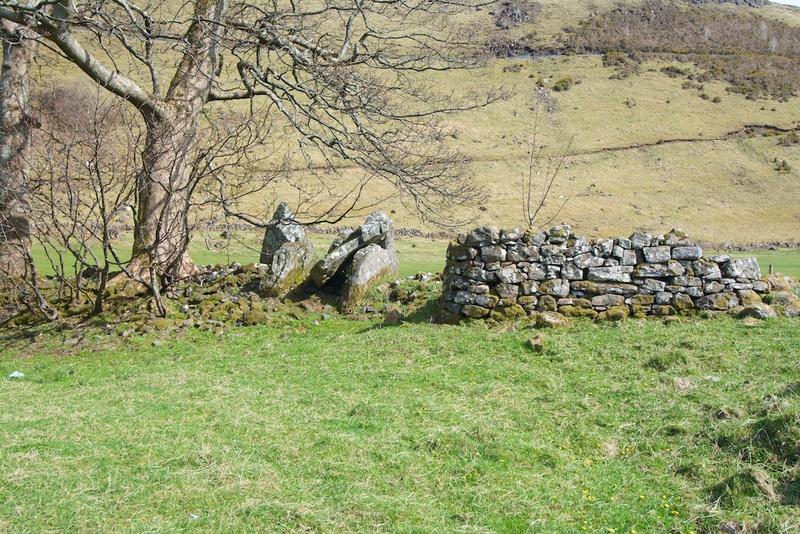 Close by are the low ruins of a structure which the RCAHMS describes as a ‘township building’ of a later date, possibly a sheep fank or a byre; it’s very likely that rubble from the cairn was used in the construction of this. 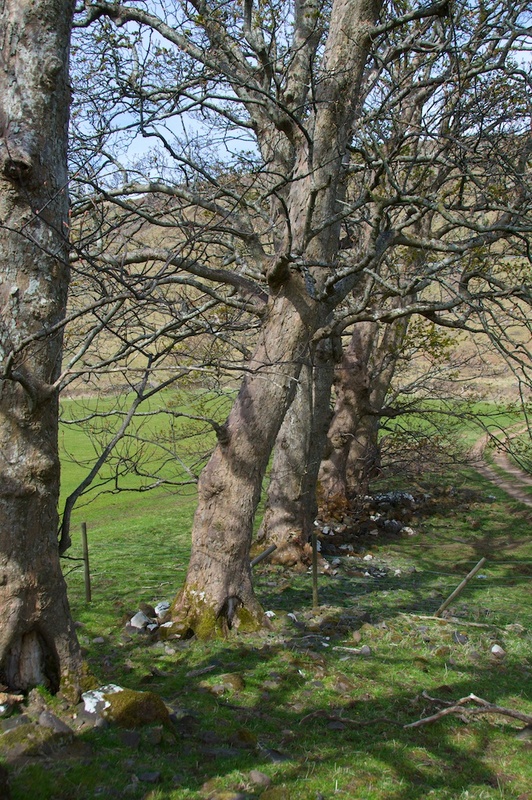 The burial chamber stands at the end of a row of sycamore trees, which may at one time have marked a field boundary. They offer a shady processional route, but a modern one because they must be less than 100 years old. I noticed that the last tree was bending its branches over the site, as if to shield it from public view. One of the lower branches was curiously twisted, having changed direction to grow towards something unseen. 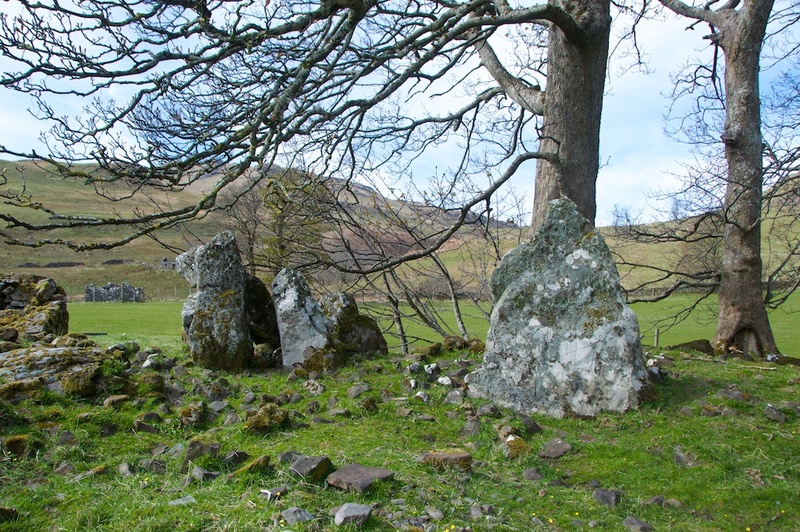 With hindsight, I am tempted to wonder if the cairn is sited over a blind spring. About 50 yards further down, even closer to the shore, is another enigma: a standing stone, inscribed with a cross. 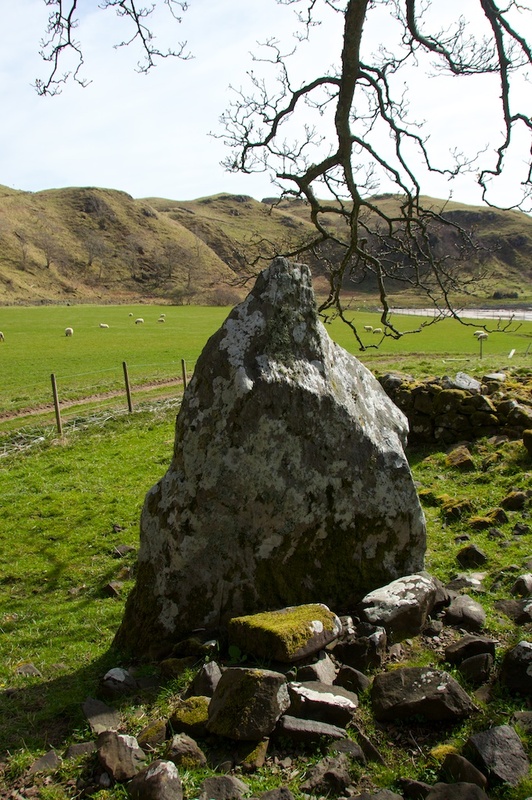 According to several historical sources it seems that the stone itself may have been put there in the Bronze Age, and carved with a cross in the 6th century, or maybe slightly later. There are, in fact two crosses on its seaward-facing surface – a much smaller one has been squashed in above a carving of an animal. 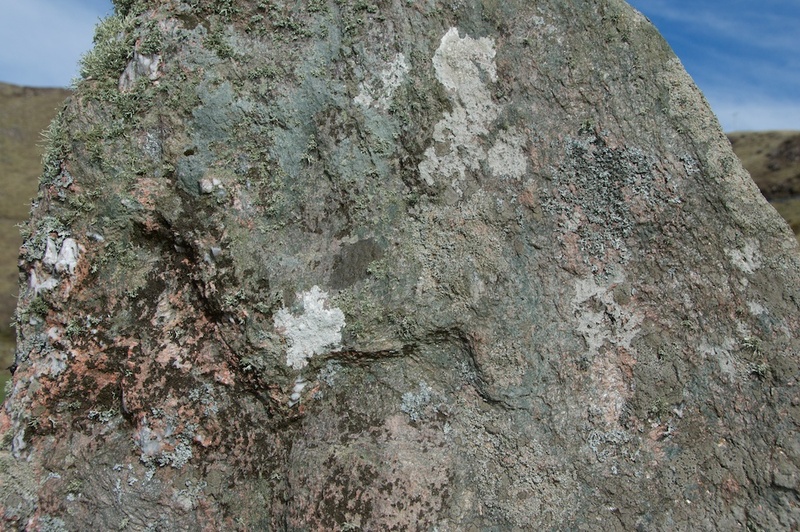 One site suggests that the animal is a dog, although the combined effects of lichen and weathering have made it pretty indistinct. If there were ever any carvings on the landward side, they have not survived. 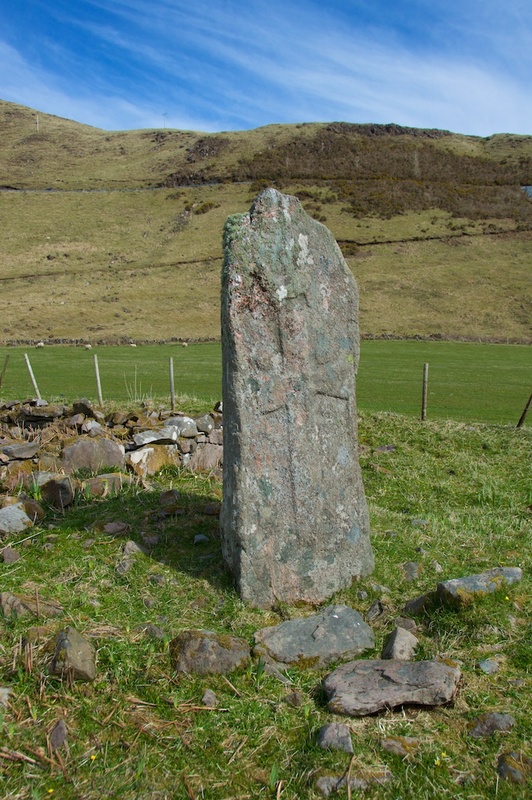 Local tradition says that this stone marks the resting place of an early Irish saint known as St Ciaran (also spelled Ciarain or Kieran), who died in 549 AD – hence its name in Gaelic, Cladh Chiarain, or Ciaran’s grave. A couple of sources identify him as Ciaran mac an t-Saeir, (‘Ciaran, son of the carpenter’), who was an abbot of Clonmacnoise in County Offaly. But I was dismayed to learn there were no fewer than 22 saints by the name of Ciaran, and after a little bit of reading I found that St Ciaran of Clonmacnoise instructed his followers to leave his bones on a hillside after his death, rather than preserving them as relics. So, presumably there was no burial for him. 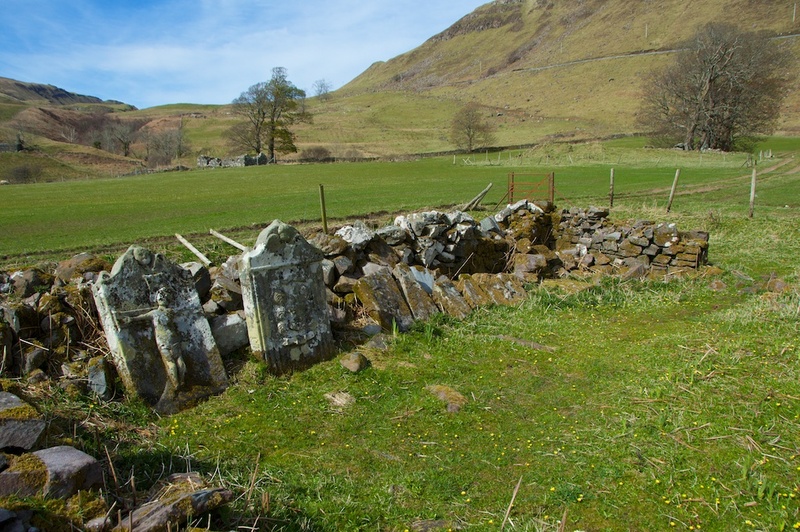 Nor was he, as far as I can tell, ever linked with Ardnamurchan in his lifetime, although these early saints were known for their wanderings; there seem to be quite a few churches dedicated to a St Ciaran dotted around Scotland. The bay is overlooked by Beinn Hiant, which at 1,700 feet is the highest peak in Ardnamurchan; its name translates as ‘holy mountain’, but the word ‘hiant’, derived from ‘shiant’, can also mean ‘magic’ or ‘enchanted’. 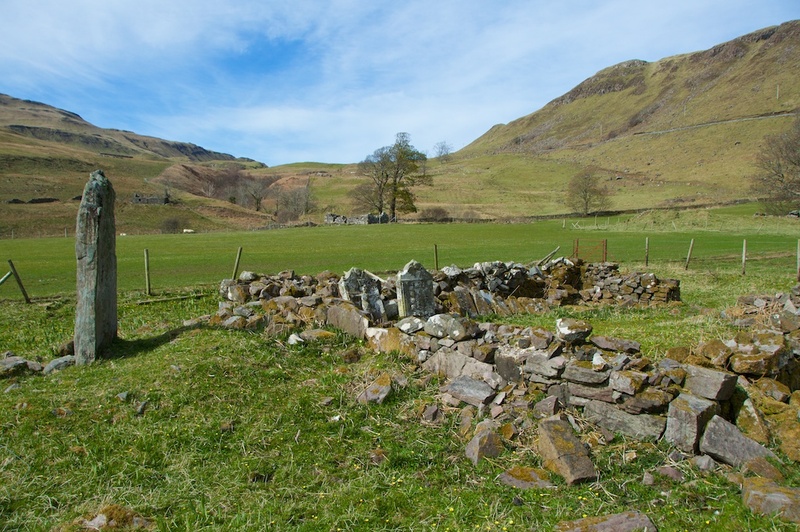 This may well have been the reason why this secluded place was first chosen as a burial site. 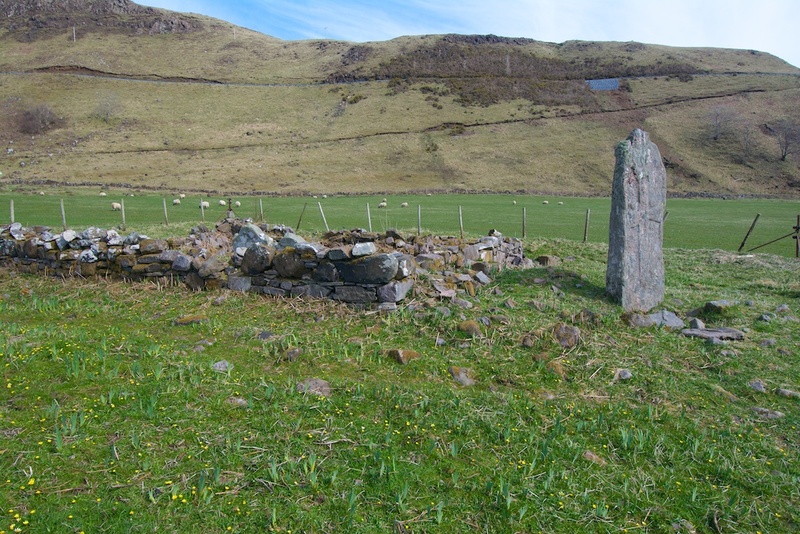 And Camas nan Geall, the ‘Bay of Strangers’… who were they? 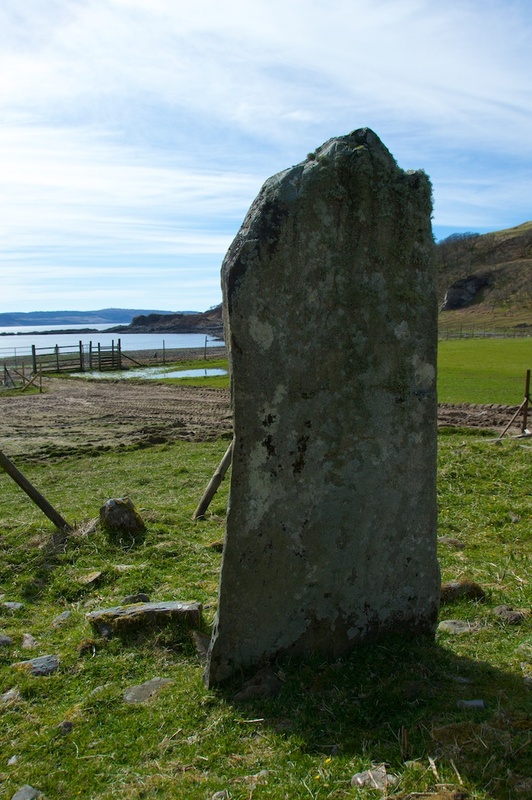 The little bay faces south-west across the mouth of Loch Sunart, towards the north-east coast of Mull which has its own standing stones and an early chapel just outside Tobermory. 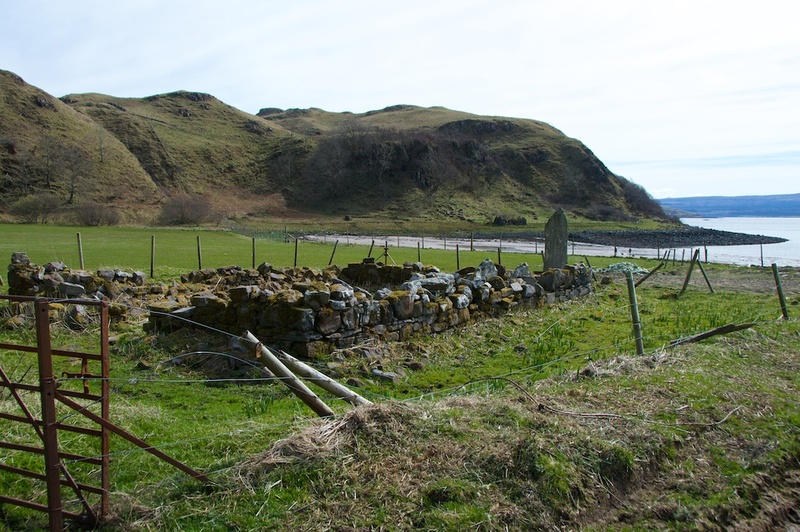 Maybe we shouldn’t view this site in isolation; our ancestors were seafarers, and for all we know this could have been a familiar stopping point on a well-travelled and much-loved coastline. Such tantalising fragments – but it’s like picking up a couple of twigs and trying to make a tree. You just can’t do it, at least on a purely logical level. Yet there’s still something about this place. 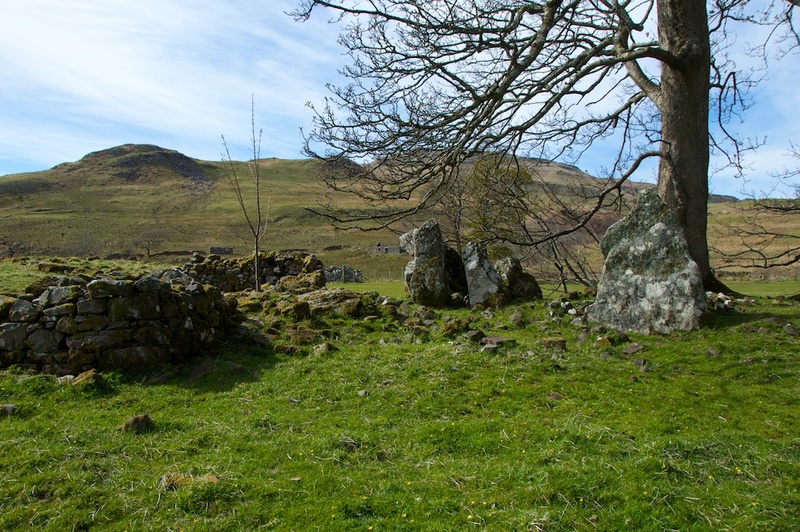 Flanked on three sides by hills, the green fields of Camas nan Geall feel protected, as if cradled in a cupped hand. How many tides have come and gone since the first people were buried here? Maybe that has something to do with it, too. Ever-present but ever-changing, the water’s edge echoes the line between the known and the unknown, between this world and the next. Footnote: A couple of Gaelic-speaking readers have observed, correctly, that ‘geall’ means ‘promises’ and that ‘gall’ means ‘strangers’. I have queried this point with Anna Nicguaire, a Gaelic speaker who is a professional consultant in the heritage sector. She confirmed those definitions and spellings, but advised me that many place names have been mis-spelled over the centuries and the mistake is often perpetuated, so that ‘Camas nan Gall’ may have become ‘Camas nan Geall’ on maps and in documents; but in this case the translation of ‘Bay of Strangers’ seems to have remained constant. 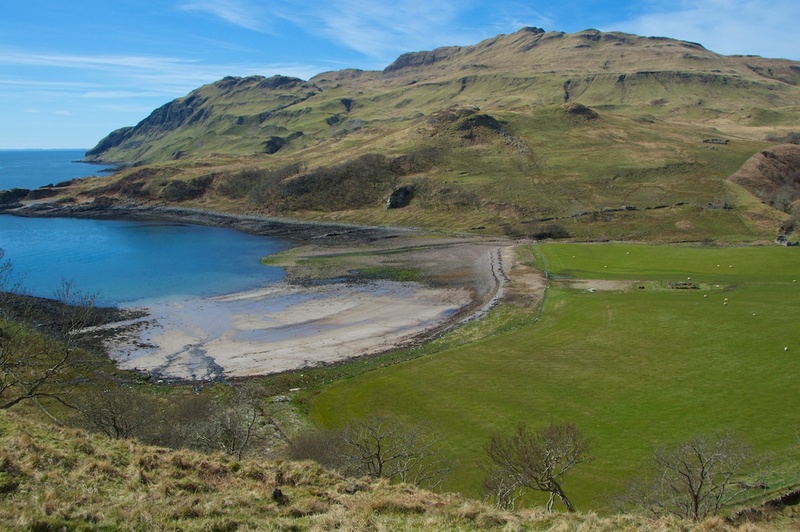 Anna also points out that there is, in fact, a ‘Rubha nan Gall’ – ‘Headland of Strangers’ – on the coastline of Mull, visible from Camas nan Geall. My thanks to Anna for her kind help. Visit her website at uiseag.com, where she writes about archaeological sites and many other places of interest. Great post and it certainly would have been an interesting view from there in 1480 with such a great view of Bloody Bay across the water. Looks a lovely spot Jo. Very quiet and peaceful. You’re right, David, it certainly is. I would love to go back, having written about it now! What a beautiful place, and clearly somewhere that has been special for a long time. 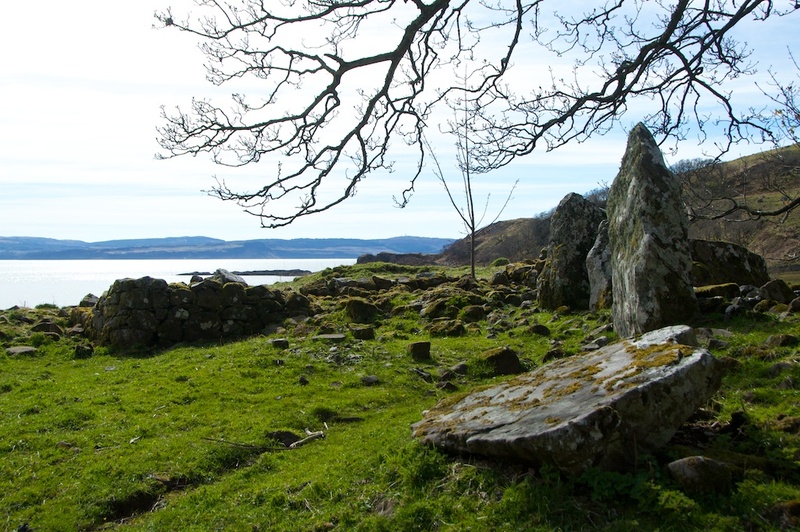 I’ve visited the standing stones and ruined chapel near Tobermory, and it’s tempting to imagine that the beautiful prehistoric sites on Ardnamurchan were visited by the same people. The 18th Century gravestones are stunning too. I know, Caroline, somewhere you would love, I’m sure. I have never been to the stones or chapel at Tobermory, but would love to do so. 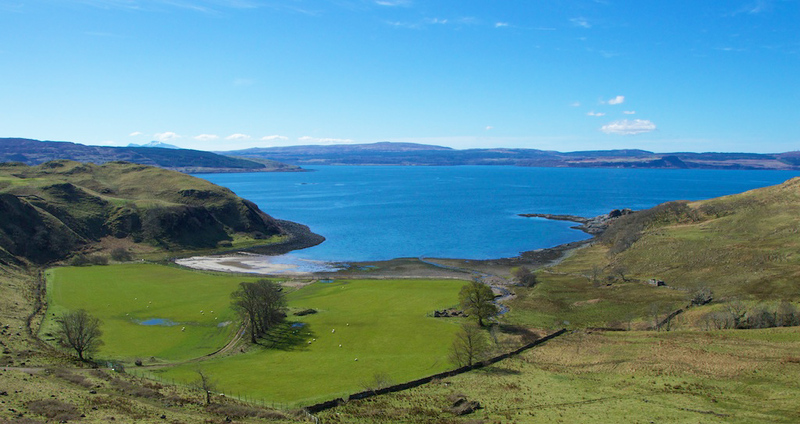 We’re long overdue a visit to Mull! I find the idea of the network of sea routes connecting these places very appealing. What seems remote to us may not have been so, back then, even though the population was small and scattered. Yes, the gravestones are fantastic, and have survived very well. A beautiful place! What an interesting post – & beautifully written with fantastic photos.These prehistoric sites on the edge of the world are intriguing. Thanks, Jo. Thank you, Marie, you’re very kind! 🙂 And yes, there is just something about these places, and their setting, that keeps drawing me in. You’ve caught my fancy again! Now I’ll be wondering about who is buried here and who buried them. What was the service like? What was included with them in the grave? Where’s Doctor Who when you need him? 🙂 Somewhere in all those islands there must be more to be found that will tell us more about what their lives were like. Thanks, Jo. What a beautiful place to be laid to rest. Haha, I know exactly how you feel, Pat! Yes, a Tardis would be most useful! 🙂 And as you say, there is so much more history hidden under the surface, across the whole country, just waiting to be discovered. You’re most welcome and I loved sharing my experiences of Ardnamurchan. It has just made me want to go back! New to your Site Jo. I love the variety of your Blog. I too have never been to Ardnamuchan, but this is inspiring. Thank you. That’s lovely. Thanks for the trip. Wonderful scenery and history! Scotland is blessed with an abundance of both! Yes – you are so right! I love finding places like this, in such out-of-the-way places. Thanks, Lynne – yes, a fascinating place, one that I’d found on the map beforehand this time! 🙂 But I didn’t expect it to be in such a lovely setting. Beautiful. There are a few peaks higher than Ben Hiant ion Ardnamurchan though – Sgurr Dhomhnuill and Ben Resipole for example. Thank you, Derek! Ah, well I guess it depends on what area you consider to be Ardnamurchan. Those two peaks lie to the east, in Sunart and Ardgour. But I know that some people look on Ardnamurchan as being a wider area than just the peninsula. I remember hearing that the body of a sailor was washed ashore at Camas ban Geall during the war and was buried in or near the graveyard, do you know anything about this? Hi Linda, I hadn’t heard of it, but it’s certainly possible, and the coastline of Argyll and the islands has many such graves. I did a quick search this evening and turned up nothing, but will let you know if I come across anything! Thanks for your comment. 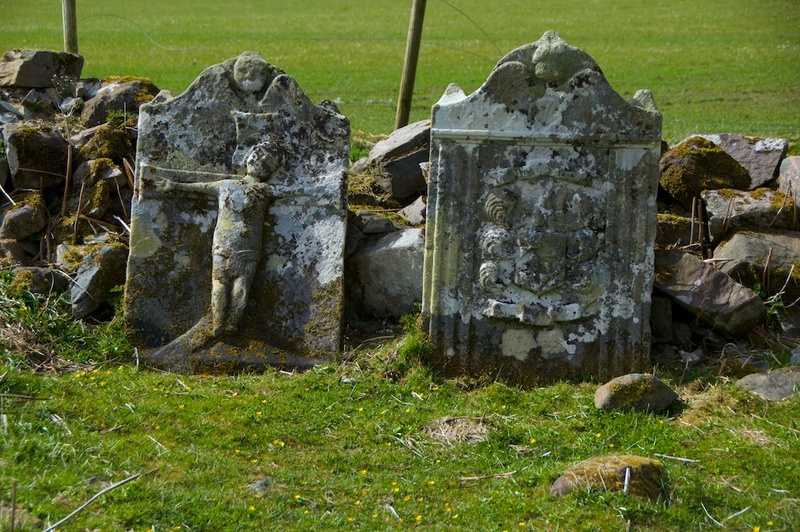 PS: Just as soon as I wrote that, I came across this: http://kilchoan.blogspot.co.uk/2011/10/kilmory-churchyard.html – two graves, near Kilmory on the north coast of Ardnamurchan. A sad story, but a lovely spot in which to be buried. Thank you for the blog and the work you have done researching this. Excellent. You are very kind, thank you! Had a look at your own blog – brilliant photos. I was startled to read this. Years ago I walked down to the bay, and while I was by the graveyard, I saw a figure out of the corner of my eye, wrapped in homespun tweed plaid the colour of peaty water. Not there, of course, but there was a strong sense of being protected. A word you used in your evocative piece, hence my being so startled. More recently, I told this someone who loves the area too and who wouldn’t scoff (a fellow dowser). He told me he had walked out to sit on the hillside by the ruined township. And he saw a figure rowing a curricle to the shore. And he’d never told anyone either. It’s a remarkable place, for all its small size. I do wonder who my figure was, but I still think of him if I need to feel safe. Oh, that’s wonderful! I love your description of the figure wearing plaid ‘the colour of peaty water’. How very interesting, and fitting, that you felt a strong sense of being protected. There is something about that place, most definitely. And the experience of your friend – fascinating. I can imagine it. I feel as if I want to go back there! Thank you so much for sharing this.